Since 2009 Poliplast manufactures 150, 250, and 490 kg capacity scissor type transporters. The positioners are moved vertically with scissor type gears and polyester fiber belts. The belt loading capacity is at least 5 times that of the automatic arm positioned. Along with scissor type transporters, there are 150 kg capacity cantilever type transporters and 1000 kg capacity cart type transporters. All the transporters are equipped with wireless remote controls. Exact positioning is provided by laser distance gages. Transporters can be fitted with ventilation boxes and automatic covers for increasing ventilation efficiency. Solution splashing during piece transportation in transporters is avoided with drop trays. The tray is operated automatically by the automatic line control system. 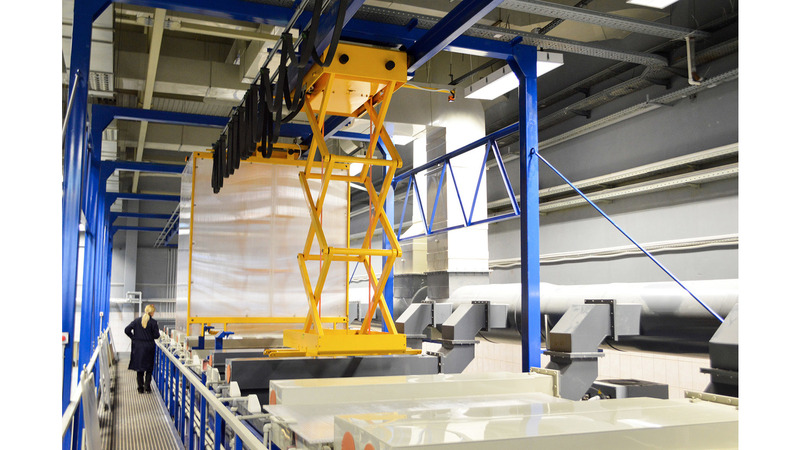 The collected splashed solution is delivered to drainage through special trays installed along the galvanizing lines. Type of transport system is selected according to processing requirements: load capacity, size and location of the electroplating line.